The route in post #5? Last time I rode that way, I went south east from Cantavieja to La Inglesuela del Cid, then north east to Morella via Cinctorres. I can't remember the detail, except it was a lovely ride. Previously I'd ridden north west on the A-226 up towards Villarluengo, short detour to Pitarque, then on to the N420. The A-226 that way is a fairly minor road, a bit bumpy, very twisty but goes through some properly amazing scenery. I'd say it's worth it from that point of view (and the sense of relief when reaching the N road and being able to get above 3rd gear for the first time in a while!). This was on my R1200GS - I wouldn' t choose to ride it on current bike (K1600GT) as it would be a bit too much like hard work. 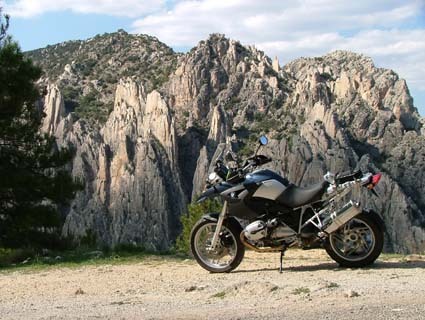 This was taken just south of Villarluengo - it's one of my favourite bike photos. It doesn't really give the scale of the scenery; between the bike and the rock formation in the background was a very deep gorge. Nope, that's the A-1702 you were on my good man! fantastic road and, as you say, amazing scenery!